A month ago I was in California with my best friend and her daughters, where I filmed a few updo hairstyles. 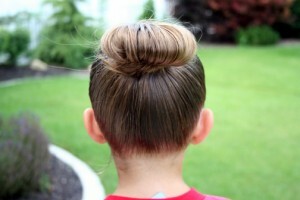 This one is perfect for cheerleading or ballet, since it is a bun hairstyle, but it is also perfect for occasions such as prom or other formal occasions! I forgot to snap a few still shots of this style when I was in California, so I recreated the hairstyle on my daughter last week. What I love about this particular bun style is that you can finish it off in any number of ways. 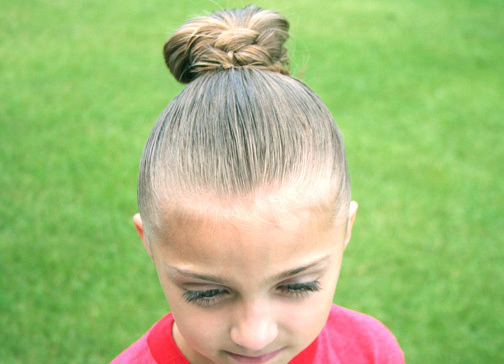 We show three options here… wrapping the bun with a braid, splitting the hair and then cross wrapping, and then twisting the hair strands and wrapping. One that I forgot to mention is that you could fishtail braid the strands and then wrap the bun. That makes four options you can use! 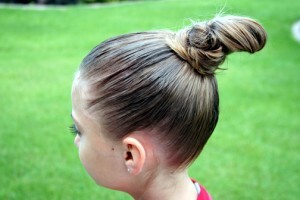 This tutorial is filmed on the daughter of my best friend, who can sometimes be a goof! Check out her cheesy smiles anytime the camera focuses in on her directly! She is a great girl! Enjoy! Items Needed: Brush, comb, water bottle, 2 hairbands, 2-3 bobby pins, and gel/pomade/hairspray (if desired).